A new love has come my way. Well, not exactly new ... but let’s just say, my eyes have been opened to his oh-so-clear-and-present charms. But his name is the daffiest thing this side of Greenwich Avenue. 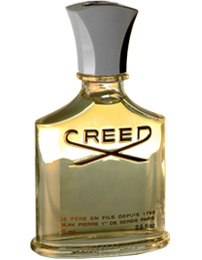 That said, Creed’s Acier Aluminium is no stranger to the high-end men’s fragrance scene. Released back, prenatus Vetrivressum, in 1973, he’s recently begun something of a resurgence in popularity among the sartorial set. And, what I love so much about Acier Aluminium (try saying that three-times-fast) is that it moves at its own very leisurely pace through a full-dress olfactory pyramid. The drydown alone, with its spices, ambergris and drop-dead-gorgeous vanilla absolute, is worth the price of admission. Orientals are in sore need of reevaluation by men’s fragrance wearers, and like Le Labo Patchouli 24, Shalimar extrait, Habit Rouge and Opium pour Homme and the new La Nuit de l’Homme, Acier Aluminium should constitute a must-try for Summer 2009 and beyond.